The Rev. Andrew Bullock came to us in February, 1971, from Bethany Baptist Church near Fredericksburg, where he was pastor. He had received his Bachelor of Divinity Degree from Union Theological Seminary in Richmond in 1969. Pastor Bullock led us in a building program. In 1961, Gloucester Point Baptist Church had purchased several lots on Route 17, just west of the Coleman Bridge. Now in August, 1971, the church voted to sell this acreage and, instead, to purchase a four-acre tract on Route 1202, now Terrapin Cove Road, from James and Frances Phillips and Donald and Camille Sterling for $20,000. Mr. Roy Cava was employed as the architect and plans were developed. Mr. W.A. Colbert was hired as contractor, and Walden Carmine assumed chairmanship of the Building Committee. A Living Memorial Fund was established and these contributions benefited the Building Fund greatly. 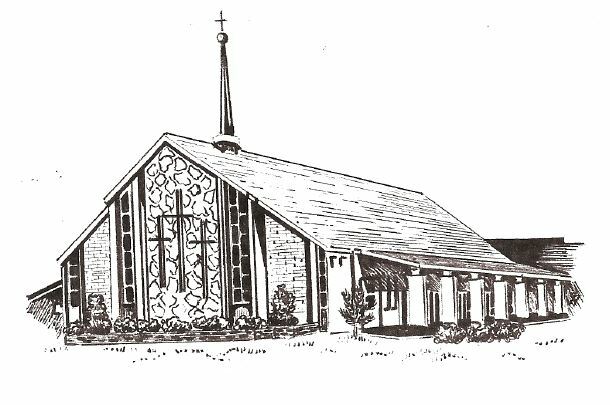 On June 3, 1973, a ground-breaking ceremony was held for the new building: a sanctuary seating three-hundred fifty and an educational building with twelve classrooms, church office, pastor’s study, kitchen and large narthex. The cost was $237,000. The first worship service was held in the new sanctuary a little over a year later, on July 28, 1974. A special Service of Dedication was held on September 29, 1974, at which time the cornerstone was laid. Placed in the cornerstone were the following: a copy of the Holy Bible, a list of charter members and current membership, the church Articles of Faith, the 1974-75 church budget, the most recent minutes of the Peninsula Baptist Association, and the latest edition of the Religious Herald. Andy and his wife, Mary Lee, organized a Youth Bible Fellowship and gave direction to it until January, 1973, when this work was turned over to Ron and Beth Benoit. This couple came to us (as Bible college graduates with missionary experience) to guide our church youth. They left in May, 1974, for the mission field. Currently the Benoits are ministering in Canada. Ron and Beth created a special ministry for children at Gloucester Point Baptist in May, 1973. Children’s Church was held during the morning worship hour for youngsters ages three to seven. This class expanded to two graded groups in 1977. A Children’s Sermon was introduced into the worship service in 1977 and remains a highlight for our continuing Children’s Church program. In 1975, a Senior Citizen’s Banquet was held for the first time. W.M.U. initiated this function and Adult I Sunday School class, and later the Youth, sponsored this annual event. Now the deacons continue the tradition by treating church widows and widowers to a dinner in early spring. Rev. Bullock served as revival preacher in many Virginia churches during his time with us. He and his wife also shared in the Northeast England Crusade in September, 1975, with Evangelist Howard Baldwin. This mission outreach was financially supported by our congregation and friends. Our church’s heart for missions is shown by the fact that we have participated enthusiastically in Peninsula Baptist Association World Missions Conferences, generally hosting one missionary each time. Records show these were held in 1975, 1976, 1979, 1987, 1991, 1995, and 1999. We also held a prayer rally at Gloucester Point Baptist to support the Billy Graham Crusade on the Peninsula in October, 1974. Our church began Home Bible Fellowships in 1974, as outreach ministries. These Bible studies were held in various homes (an informal setting) to encourage friends and neighbors to learn about God and to mature in their faith. They were an ongoing ministry for fourteen years. Daily Vacation Bible School continued to thrive every summer. Perhaps the highest enrollment came in 1976, when the rooms overflowed with two-hundred twenty-seven workers and children. That year one class had to meet in the sanctuary! In 1975 the church, acting on a recommendation from Pastor Bullock, created a Long-Range Planning Committee, consisting of twenty members, to provide insight as to future direction for Gloucester Point Baptist Church. The five sub-committees — Christian Education, Finance, Properties, Missions and Staff and Personnel — researched, evaluated and formulated recommendations. Tom Riley, as Chairman, was well assisted by advisor Rev. Marion Dubose. After a year of hard work, the committee presented its twenty-eight page report to the church. The recommendations acted upon were: 1) establishment of a Personnel Committee; 2) establishment of a Stewardship Committee (rather than a Budget or Finance Committee) to expand monetary matters to include stewardship commitment and budget emphasis; 3) setting up a new line-item budget format; 4) increasing our mission budget from 5 1/2% in 1976, gradually, to 12% by 1980; 5) hiring a part-time church secretary (Charlene Diggs, church member, was hired October, 1976. She resigned in April, 1982, to work elsewhere full-time and Sandra Brewer joined the church staff the following month); 6) selling the parsonage (accomplished in 1980); 7) creating a Benevolence Fund to respond to the many requests from individuals for aid. A special offering is received quarterly for that purpose; 8) reactivating the church council. In 1976, our resident membership was 245 and accordingly, the church hired a part-time Minister of Youth, Thom-as Braziel. Mr. Braziel had received a Masters of Religious Education Degree from Southern Baptist Theological Semi-nary and, while at Gloucester Point, also taught at Immanuel Church Christian School in Newport News. Tom and his wife, Cathey, worked with the church youth and children for eighteen months. Tom’s love for music led him to direct a youth choir as well as to participate in our adult choir himself. The Braziels have remained in Christian service. Tom is currently Minister of Education and Senior Adults at First Baptist Church in Fitzgerald, Georgia. Pastor Andrew Bullock resigned at the end of 1977, to accept a call from the Stockton Memorial Baptist Church in Richmond. Rev. Harry Hubbard served as interim pastor until August of 1978, when Dr. Paul R. Garber accepted our call to become minister of Gloucester Point Baptist Church. Dr. Garber came to us from Tallahassee, Florida, where he was an Assistant Professor of Religion and Humanities at Florida A & M University. He received his Bachelor of Divinity and Master of Theology Degrees from Southeastern Seminary and his Ph.D. in Humanities and Religion from Florida State University. In December, 1978, the church hired Elizabeth Garber, Dr. Garber’s wife, as our first part-time Minister of Music. We felt very fortunate to obtain the services of a professional choirmaster, pianist and organist. Mrs. Garber is a graduate of the School of Church Music of Southwestern Baptist Theological Seminary. Elizabeth initiated and maintained graded children’s choirs, which met alternately with missions on Wednesday evenings. The Music Makers were four and five-year-olds; the Carol Choir was grades one to three; the Concord Choir was grades four to six; the Youth Choir was grades seven through twelve. Our youth were inspired by their choir experience to attend Eagle Eyrie Baptist Music Camp every summer, two sessions, a tradition that persisted until the early 1990’s. Meanwhile, Alice Deal, who had been Gloucester Point Baptist’s (volunteer) Chancel Choir director for the twelve years prior to Mrs. Garber, turned her love for music into a new ministry: Missions Musicians. Initiated by Elizabeth Garber in January, 1979, the M and M senior musicians met two times a month to sing for shut-ins and at nursing homes. Dr. Garber’s first big event at Gloucester Point Baptist was the Twentieth Anniversary Church Celebration held on October 21, 1979. In preparation, the membership con-ducted a neighborhood survey/census one weekend in September to encourage church involvement. Seventy families were extended an invitation to our homecoming. The following summer, 1980, our church reached out in a new way: we sponsored a Laotian refugee family. Our membership provided a trailer for a young couple, Lon and Chandaly Banthongsack, their baby, Poupi, and Jerry Khamvongsa, Chandaly’s brother. The men worked for Benny Belvin in Guinea, and we gave them a car and taught Lon how to drive. At first they were dependent on us for food, clothing and English lessons, but by January, when a new baby, Anuson, was born, they had become more independent. In April, 1981, the Banthongsacks relocated to Hampton, where their parents were newly settled. It was hard to see them go. The years 1982—1986 could be termed “the quiet years” in the life of our church. Paul Garber’s style of ministry emerged; his gifts clearly were pastoring and teaching. A special concern of Dr. Garber’s was World Hunger. Tom Riley coordinated a CROP Fast annually to raise money for this need. Dr. Garber also initiated a special Thanksgiving Day Service at Patrick Henry Hospital (now Riverside Regional Convalescent Center). Congregation members escorted patients to the chapel and conducted a Thanksgiving Service. This ministry has become an annual event. Three staff persons were involved with our church during these five years. Jack Neathery was Minister of Music briefly in 1983. That same year the church hired Karen Beale, a graduate of William and Mary, as a summer youth worker. Sandra Fox joined the staff as part-time Minister of Music in 1984, and ably led the music program for three years. Gloucester Point Baptist sponsored a Cadette-Senior Girl Scout troop from September, 1982, to June, 1987. Linda Breaks led Troop #1065 those five years and continued our church involvement with scouting. Perhaps the largest, most far-reaching project begun during this time was the Gloucester Point Baptist Church Preschool, started in the fall of 1984, through the inspiration of Nancy Wilburn. This Christian outreach to the community uses the church facilities, is financially self-supporting and is administered by a board of directors chosen from the church congregation. Separate classes for three and four-year-olds meet three mornings per week. The Preschool Director serves as liaison between church and school. This communication has been vital when is-sues have arisen, such as construction of a playground, storage building and planning for new classroom space. Linda Breaks, Preschool Director from 1985-1991, relates that Paul Garber was an invaluable ally during those early years. As the “man behind the scenes,” he welcomed parents, befriended the children and worked tirelessly to make this venture a success. Our Preschool ministry persists today and continues to provide outstanding Christian care and instruction. This chapter would not be complete without mentioning our church Building and Grounds Committee, who have worked tirelessly through the years maintaining the new building and four acres of land. Their tasks have included: 1) landscaping; 2) developing a ball field; 3) dealing with a finicky heating and cooling system; 4) snow removal; 5) coping with two direct lightning strikes; 6) repairs from two break-ins; 7) Weekday Preschool needs such as storage and playground; 8) installing an intercom and phone system; 9) building a storage building and fencing the area; 10) responsibility for displaying a life-size outdoor nativity scene each December. Don Kappes, longtime chairman, has worked faithfully with his committee. The Woman’s Missionary Union at Gloucester Point has always done a superb job of emphasizing Lottie Moon Foreign Missions Offering during Advent. In 1980, church member JoElla Adams contributed by introducing the W.M.U. Christmas Banquet. This has become an annual festive occasion focusing on mission giving. JoElla also established a Christmas Card Tree in 1981, with Mary Peters. The congregation was encouraged to give one card to the entire church family and to donate money normally spent on cards and postage to the Lottie Moon Offering. Another tradition was lighting one candle during worship for each $100 received towards the Christmas offering.